This has got to be an April Fools’ prank! Like most newbie bloggers, I have one eye on the hit counter always and it is an absolute pleasure to see any spike on the meter at all. So, when I logged in to check the innards of the blog today, I found this! According to the graph, I have had 1500+ visits on my blog today. 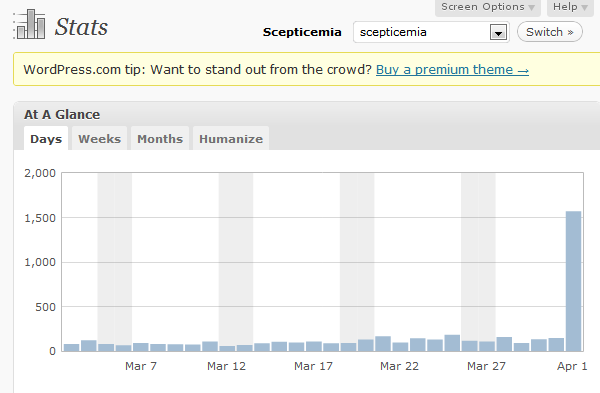 And since my blog never has even a tenth of that on a normal day, I am going to guess that it is either of two things. One, the wonderful wordpress guys, for some inexplicable reason, have realized I am OCD about the blog stats and have decided to play an unmentionably cruel prank on me. Or two, the blog meter shows 157 hits for the day, which is most likely correct, and somehow, some screw must have fallen loose somewhere in wordpressland and the graph is reading the number wrong. Actually if the graph interpreted 157 as 1570, the graph would show a peak something like this. In either case, it is a real sad thing, but thanks to the people who left 157 hits. Hope you keep coming back again! Tags: Blogging, Blogging Buddies, PostADay2011, Prank, Statistics, Wordpress. Bookmark the permalink. Previous post ← Look, Who’s My LinkedIn Buddy! And I am back.. And this sure ain’t an error.. Good things happen in Bloggerworld and bloggers like you have avid followers like me.. 🙂 Keep ’em coming..
thanks, that’s real nice, but wordpress did indeed play me! and i’m not the only one either!